Here are a couple fun Halloween meal deals going on Saturday-Monday (Unless otherwise noted). As always please be sure to call ahead to make sure that your location is participating. Cake, Hope & Love: Come in on Saturday, October 29 with your kiddos in costume and let them get a free mini ghost cupcake. Chipolte: Come into any Chipotle on Halloween, October 31 from 6 pm to closing dressed in a costume inspired by the family farm and they willl hook you up with a burrito, bowl, salad, or an order of tacos made with responsibly raised ingredients for just $2. Don Pablo’s: Kids eat free on Halloween with adult meal purchase. Thanks Erinne! Friendly’s: Stop by Friendly’s with your kids dressed in their Halloween costume and your child will receive a free ice cream cone. This starts on October 27 thru Halloween, October 31. This is only valid at participating locations. Thanks Amy! Krispy Kreme: Wear your favorite costume to Krispy Kreme on Monday, October 31 and receive your Free Halloween or Pumpkin Spice Doughnut. No purchase necessary. Max and Erma’s: Erma’s Treat Day is Monday, October 31 for kids 12 and under. Dine in with your costume and get a FREE tri to their All-You-Can Eat Sundae bar. Panera: Join them on Saturday, October 29 from 11am-2pm for a Cookie Decorating Event. Children will receive a pumpkin cookie that they can decorate and take home with them. Valid at Wilmington Pike location only. Texas Roadhouse in Huber Heights: Join them Monday, October 31 for this Halloween themed Kids Night! 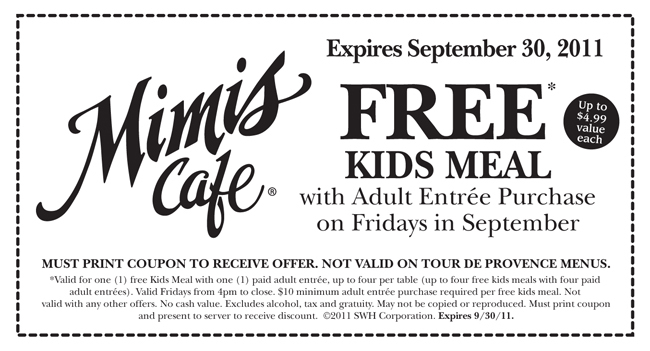 All kids dressed in costume (12 years or younger) will eat for FREE* from their Kids’ Menu! Plus, they are giving out a Halloween goodie bag filled with prizes for the best costume. T.G.I. Friday: Join them October 29-31 and receive a FREE Appetizer for any vampire, ghoul or human wearing a costume. Get free mozzarella sticks, pot stickers or crispy green bean fries. One per person, valid only at participating locations. Tumbleweed: One Free kids meal per adult entree purchase on Sunday, October 30 only. If you know of any others please feel free to share them with us! PLUS- Be sure to check back AFTER Halloween and see what you can do with all that excess candy! On October 31 head to Chipotle, dressed up in a costume inspired by the family farm and receive a burrito, bowl, salad, or order of tacos for $2 as part of Boorito 2011. Although this offer was free last Halloween, $2 is still better than full price. Arrive between 6 pm and close time to be eligible. Have some fun with your costumes. Think crops, farm tools, tractors, silos, or farm animals. Get the proverbial creative juices flowing and you might have a shot at winning a prize in the Costume Contest. Panera Bread at Town and Country is having a Cookie Decorating Event this Saturday October, 22 from 2-5pm. Children will receive a pumpkin cookie that they can decorate and take home with them.. That is if it makes it home..
Caribou Coffee is having Buy One Get One FREE -Thursday September 29. Just print out the coupon or show it on your mobile device and receive a FREE drink, any kind any size, with the purchase of another drink. So grab a friend and enjoy a cup together. My favorite thing there is the chocolate covered espresso beans. I know it’s not coffee, but they are so good. Here is our list of printable coupons and deals for retail stores and restaurants. Do you know of any others? Let us know and we’ll add it to the list. Happy Shopping! We’d hate for you to miss a deal so here is what is coming up this next week. All of the events listed below are FREE! We have some events that are only posted on our calendar and the details for the event. So, if there is no “Link”- it’s posted in the calendar. If you have a question about a specfic calendar post feel free to contact us! Who doesn’t love free ice cream? I know I do! Cold Stone Creamery is giving away 3oz samples of their new “Sprinkled with Wishes” flavor on Tuesday, September 27 from 5-8pm. Now, 3ozs is not a very big sample, especially not big enough to make a special trip there, but if you happen to be near one that night be sure to stop it. Ok, for those of you that have a son and love Chick-fil-A I have a FUN event for you!. The five Dayton-Area Chick-fil-A Restaurants are hosting a Mother Son Date Knight on September 29. Seriously, how cute is that?! Chick-fil-A will host a “Date Night” for mothers and sons on Thursday, September 29 from 4:30 to 7:30pm. During this special evening, mothers and sons are encouraged to spend some time together while they enjoy dinner, great conversation and several special activities. Seatings are available every hour, and reservations are required. You can visit http://mothersondate.com/Dayton/ to make a reservation. So, if you have a son or sons- you better go and make your reservation quick! Because with a sweet, fun event like this I’m sure it will fill up quickly!